Serif celebrates by offering free bush packs. Serif has announced an exciting update to Affinity Photo for iPad, and is marking the occasion by offering all users three bonus content packs. 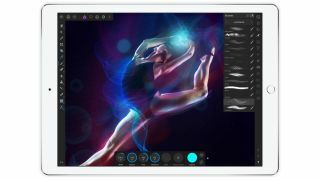 Apple's current App of the Year, Affinity Photo for iPad (US$19.99/£19.99) was designed as the first complete, professional-level photo editing app for iPad, and this revision promises even more powerful features for professional artists and designers. Version 1.6.7 features a new ‘Solo Layer View’ mode, that enables designers to isolate individual layers instantly, as well as enhancements to the Drag & Drop functions, and a ‘Show Touches’ option that lets you create more detailed screen captures (ideal for tutorials). Designers will also now be able to add their own fonts. There are exciting changes for photographers too. Users will now be able to shoot direct in RAW or HDR directly from within the app, and enjoy greater control over RAW processing. Finally, there are tweaks that promise to streamline your workflow – for example, users will be able to open and edit files in place directly from the iOS Files app, and save overwrites back to the same location (without needing to create a copy). This is Affinity Photo for iPad's third major update since it launched in June 2017. “Affinity Photo was created to take full advantage of the amazing technology the latest iPads offer, and our developers continue to work tirelessly to cement its reputation as the benchmark for creative apps on iOS,” comments Serif's MD Ashley Hewson. To celebrate the update, Serif is offering free goodies to all Affinity Photo for iPad users (offer ends 8 March). Customers will get a Luminance brush pack (13 light effect brushes), a Retouch brush pack (20 retouching brushes) and a Live Filters macro pack (28 non-destructive live filter layers). Together, these packs are worth almost as much as the app itself. Existing users can claim the free update by following the prompts in the app. To find out more, see this blog post.